I'm finally getting around to sharing more about the kitchen makeover we did in November. Today we are going to talk about one of my favorite changes.....the new lights over the island. We had a pot rack over the island for years and I decided there would be a lot less stuff for me to clean if we took it down. It would not be safe for me to keep climbing up a ladder to clean the dust and grease that landed on that as we stay in this house while we grow older. So down it came. Taking these out of the boxes was like Christmas to me. Mr. Savvy removed two of the recessed lights so he could hang the new pendants. There was one little problem. The hole was larger than the new pendant light by one inch. So then I'm thinking how can I make the lights cover up the hole that's too big? I went on line and did some research a found that we needed a recessed light converter kit so the next day I went to Home Depot. Excuse the ugly in progress shot, but I snapped this after the first light got hung. I hated that white plastic ring showing so badly and making my fancy new lights look less than fancy. So then I'm thinking how can I fix this? Rub'n Buff to the rescue! I bought a tube in Antique Gold and started rubbing it on. It literally only took me two minutes to cover this plastic ring. See, now it looks like brass just like the pendant. Look at how the ring I applied the Rub'n Buff to looks just like the rest of the fixture. You would not have known that wasn't part of the light if I hadn't shown y'all. When I'm working at the island the light from these is incredible. The pot rack filled with pots and pans was blocking one of the recessed lights. More kitchen makeover details coming soon. Source for pendants: Bellacor.com and they're on sale. Genius! What a gorgeous kitchen. 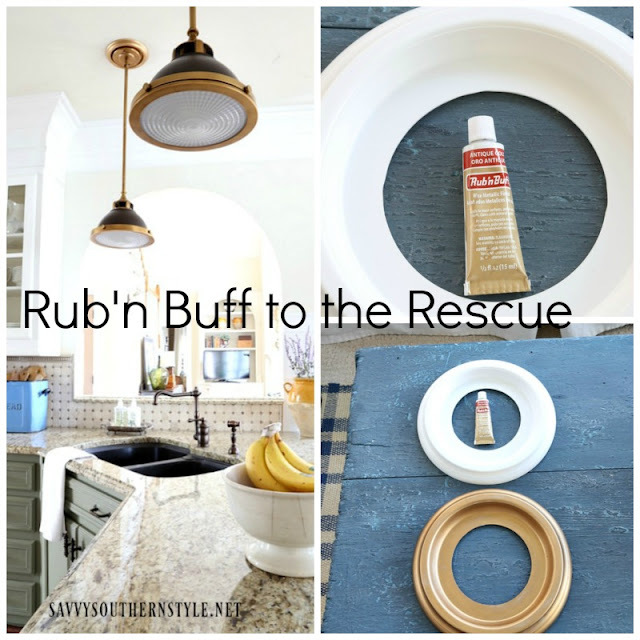 Kim, I love the pendant lights...Rub'n Buff has come to my rescue so many times! That's amazing! I wouldn't have guessed it would cover white so well. Will keep this in mind for future projects. Your kitchen and new pendants are gorgeous! Thanks for sharing! Looks amazing!.....and I am such a fan of Hinkley lighting! That Rub 'n Buff is truly a good thing!...Love the kitchen makeover! Don't you just love that stuff? Turned out great. You would never know they were white. That is completely awesome! Way to think outside the box!! I love your new light fixtures and yay for Rub 'n Buf. It looks absolutely like it came on your light. I love your kitchen too! Love it! The pendants are stunning. I first learned of Rub 'n Buff from your blog, so thank you! I have been looking for lights to put over my stove and I love the ones that you have. The thing is that I also hate the idea of getting up on the ladder to clean these lovleys. And because they are over the stove they will be quite the challenge to keep clean. Thank you as always for the great information. LOVE YOUR HOME! Love the pendant lights..and the rub and buff idea.....great! How did you put it on? a rag? a sponge or your fingers?? Oh my! What a difference the pendant lights make in your kitchen. Love it! I'm a big fan of Rub n'Buff...have used it on many different items around the house. I love those lights Kim and the rub and buff - what a great idea!! I think the larger ring actually balances off the size of the pendant better than without it! What a happy accident! Oh, wow! What a simple solution that made such an impact! We would never have known if you hadn't told us your secret! Your fix looks like part of the original light fixture, smart job! I've used RNB for so many things, one of them was my chandelier in the DR when we moved to the new house. It's a great fix! WOW!! Thank you for sharing this product! What a brilliant solution. You can't make out the converter at all. What a way to make lemonade out of lemons! What a great idea! You're right, I would have never guessed! The lights are wonderful! Who knew Rub-n-Buff!!! I would have never tried it. Thanks for sharing the tip. I love your new lights. I've been looking for a new light over my sink. I really like yours! Hey- I just realized I was on your blog list-Thanks!!! Love the new pendants! The rub-n-buff is amazing! Love your kitchen update! Design is all in the details! Perfect! I never would have known. I will have to check out the rb n buff, have never used it. Have a great weekend, Kim! Love those covers for bigger holes. Your kitchen is beautiful. I know it makes you smile every time you walk in there. You found the perfect solution and seing the first picture, I never would have guessed the trick, it's so well done! The new pendant lights are so beautiful. You had such a clever idea to install those rings and to paint them gold!! They sure look as part of the pendant! !